One lived to be almost eighty-nine; the other died before he turned forty. One thought of himself primarily as a sculptor; the other was a painter. Both were named for St. Michael the Archangel. Neither was someone you’d want as a guest at your dinner party. What they lacked in social skills, however, they made up for with creative talent: the two Michelangelos were among the finest artists that Western Civilization ever produced. The one you know by his first name (pronounced MEEK-uh-LAN-gel-oh by Italians and some art critics) was Michelangelo Buonarroti. Born in 1475, he was the principal artist of the High Renaissance. He was 23 years old when he carved the incomparable Pietà that flanks the entrance to St. Peter’s. ( We overheard an American tourist point it out to a traveling companion, calling it “that Michelangelo thing”.) He was 26 when he began chipping away at a block of Carrara marble, revealing the David who had been hiding in it. Although he excelled at carving stone, Michelangelo was also a painter; he taught himself fresco techniques to do the ceiling of the Sistine Chapel. He was an architect as well, and even wrote some poetry. Incidentally, he died in 1564, the same year Shakespeare was born. If you’re putting together a list of the all-time greatest artists, write in Michelangelo Buonarroti at #1. Somewhere near the top of that list is where the other Michelangelo also belongs. He is not usually known by that name, or his surname, which was Merisi. He is commonly referred to by the name of his hometown, which was Caravaggio. If the Renaissance was about the return to classical idealism and the discovery of perspective, you could say that Caravaggio ushered in realism and the discovery of light. 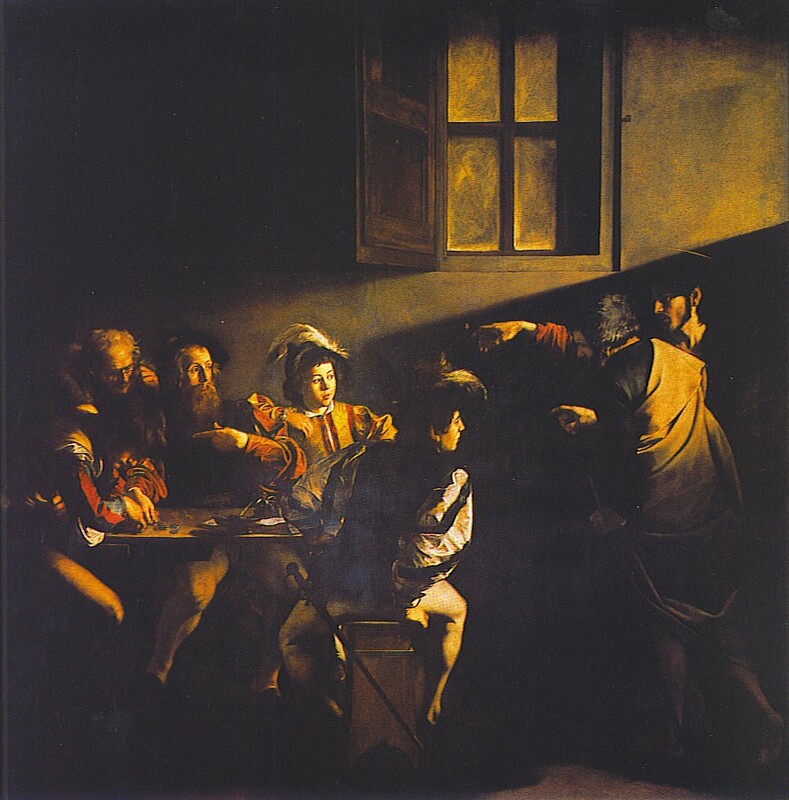 His paintings are done in high contrast — strong light and dark shadows; you Art History majors will remember the term for this approach is chiaroscuro. For those of you who weren’t Art History majors, the technical jargon doesn’t matter. Just stand in front of Caravaggio’s Calling of St. Matthew or Crucifixion of St. Peter and marvel at the way he “lit” the scene, and the way he captured the key moment in the drama — what photographers sometimes call “the peak of the action”. In the early seventeenth century, contemporary audiences were shocked by Caravaggio’s use of ordinary people with dirty feet and callused hands as models for saints. They were also shocked by his terrible behavior. From 1600 on, he was almost constantly in trouble with the authorities, brought up on charges ranging from wounding a soldier to throwing a plate of artichokes into the face of a waiter. In other words, if Caravaggio was living now, he’d be regularly featured on the E! Channel. OK — so let’s go back to my hypothetical list of the all-time greatest artists. I’ve already admitted my bias toward Caravaggio; who do you think is worthy of a Top-10 ranking? Nominations are welcome in the Comments section. Just to get you thinking… What about Diego Velázquez? Bernini? Pieter Bruegel? Vermeer? Albrecht Dürer? Picasso? Renoir? Or, what the heck — the woman who painted that mural in your den? This entry was posted in Art and tagged Caravaggio, Michelangelo, Michelangelo Buonarroti, Michelangelo Merisi. Bookmark the permalink. Rembrandt is probably rolling over in his grave, but I really like Maxfield Parrish. Maxfield Parrish essentially had two careers as an artist. His early work — fairy tale illustrations and so forth — was extremely popular and is still widely reproduced. In the 1930s he abandoned that style and painted beautifully-rendered landscapes. If you saw a work from his early period hanging next to one from his maturity, you’d swear it was the work of two different artists. As for Rembrandt rolling over in his grave, he is believed to be entombed somewhere in the floor of a church (Westerkerk) in Amsterdam, under the pews. In those tight quarters, I don’t think he’ll be doing any rolling. I love Caravaggio too. (Also the Dutch masters, particularly Vermeer. But that’s a different story. A Louvre story.) Before a 2006 trip to Ireland I read Jonathan Harr’s “The Lost Painting,” and was very excited to see the Caravaggio that had been “lost” for 200 years. It’s lovely in person, btw. Recommend the book, too, though I suspect you’ve read it already. No, I haven’t read it, but I’ll keep an eye out for it. If you like Vermeer, you might be interested in a book called “The Forger’s Spell”, about a guy who was cranking out “lost” Vermeers that fooled experts and collectors during World War II.